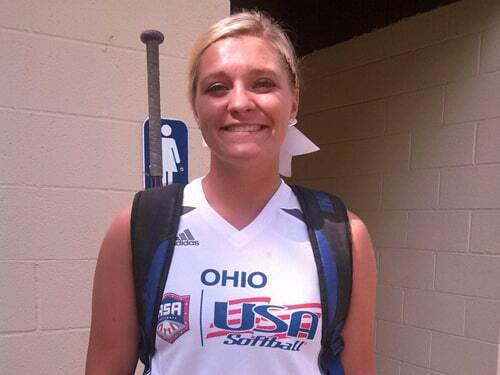 Greenville High School graduate Ally Russell played for the Ohio All Stars against the USA Junior Women’s National Team. GREENVILLE – Greenville’s Ally Russell competed for the Ohio All Stars against the USA Junior Women’s National Team this past week. Russell and other top players from across Ohio took on the junior national team in a doubleheader on June 18 in Ashland. Like Russell, most of her Ohio teammates just graduated high school while the national team players were college players, mostly from the Pac-12 Conference or Southeastern Conference. Russell got to hit against the national team and also pitched a scoreless inning. Getting to play against such tough competition was a blessing for the Greenville High School graduate. It let her see what she can handle and what she needs to work on as she prepares to play for Wright State University. “I got a little more confident I think,” Russell said. Russell also recently was named first team all-North Region by the National Fastpitch Coaches Association. This is the third consecutive season that she was named first team all-region by the NFCA. “Very, very awesome,” she said. Russell was one of 16 girls to be named first team all-North Region. She was joined by players from Illinois, Michigan, Ohio and Wisconsin. The Greenville graduate was one of four pitchers to make the region’s first team. Ohio led the way with nine players on the North Region’s first team. Brecksville-Broadview Heights, Champion, Keystone, Lakota West and Tinora were the other Ohio schools to have players earn first team all-region honors.